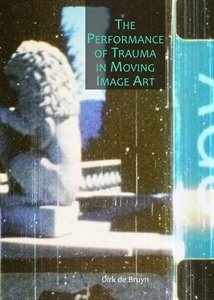 With reference to recent neurological research into Post-Traumatic Stress Disorder (PTSD) using new imaging technologies and models of implicit and explicit memory systems developed from this research, The Performance of Trauma in Moving Image Art examines the capacity of an artist’s cinema of experimental and avant-garde film to perform and communicate traumatic experience. De Bruyn analyses key films from the 1940s to the present that perform aspects of overwhelming experience through their approach, structure, content and perceptual impact, mapping a trajectory from analogue to contemporary digital moving image practice. He argues for the inclusion of Peter Gidal’s 1970s conception of ‘materialist film’ into the genre of ‘trauma cinema’ through its capacity to articulate un-locatability and perceptually perform dis-orientation and a flashback effect, all further identified here as key characteristics of digital moving image practice. The discussion explores the following questions. Can ‘materialist film’ model traumatic memory and perform the traumatic flashback? Does the capacity to articulate trauma’s un-speakability and invisibility give this practice a renewed relevance in digital media’s preoccupation with surface and the impact of information overload? De Bruyn’s phenomenological ‘traumatic’ reading of materialist film steps beyond Gidal’s original anti-illusionist rationale to incorporate critiques effectively mounted against it by the founders of a ‘70s feminist psychoanalytic counter-cinema. This contemporary re-reading further re-evaluates the Minimalist turn in painting and sculpture after the Second World War, arguing that this development is not essentialist or visionary but makes visible the implicit mechanisms of denial and erasure at the core of traumatic remembering. For de Bruyn, the initial traumatic impact of industrialization on the body’s perceptual apparatus, traceable through the advent of cinema and train travel, is communicated by such moving image art. The development of digital technology marks a new cycle of such perceptual re-balancing for which materialist film is uniquely positioned and which it critically addresses.